Myriam Fialho was born in 1930 in Monte Estoril, Portugal. She began to paint when she awas three years old. 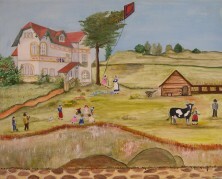 In 1950 she moved to Alentejo, Portugal. She studied psychology and began her artistic career in 1974.